Are we using our brain anymore? One might have innumerable problems regarding many issues but one solution is always available to eradicate all the troubles one might be having. Internet! Yes, you read it correct. Internet works as a magic wand and undoubtedly does wonders. Yet, one question remains. Is internet a blessing or a destruction of human intelligence in disguise? Although at first glance it might seem like an effective solution to all problems, but what it really does is it paralyzes our brain. I mean, who puts an effort in brainstorming or thinking when all the information is available in Google? It seems as though thinking is a wasted labour. We no longer bother to devise a plan or to think because everything is already available in Google. These days, one thinks and others follow. We check the reviews of a movie before watching it because who would want to waste the precious three hours of his/her life by watching a movie that is not even worth it? However, in this process we do not often allow ourselves to form our own opinion. Therefore, we are making someone else's opinion our own. We do not realise that what is "bad" for someone else might not be that bad to us. This is how internet is affecting our mentality. What started out as an era of technological advancement is leaving a bewildered society in its wake. People ranging from adolescent to senior citizens have access to internet with the "blessing" of smartphones. 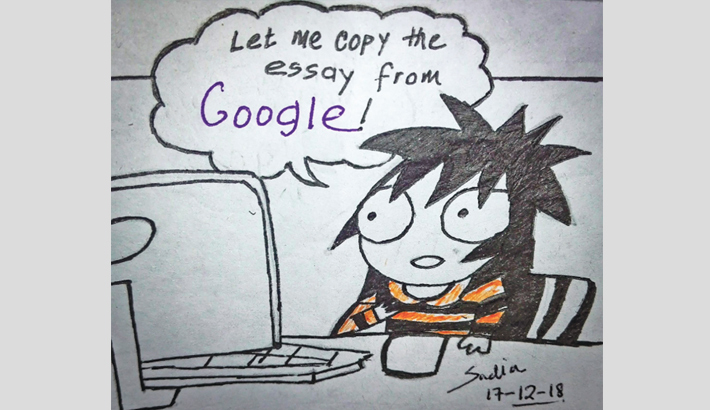 When asked to write an essay, one's first resort would always be Google. Not only this, but children these days prefer staying home and playing "Ludo Star" on their respective smartphones than playing Ludo in real life with their friends. This is how children are being tangled in the loop of trance caused by internet and getting detached from their friends and family. Their curiosity to go out and explore more have somewhat waned. Not only does it affect children, but it also affects adults. Having an existence in virtual world is more significant than proving our existence in real world. Saving "memories" in Snapchat is worthy than actually living in the moment and enjoying it. Have we lost faith in our memory that we now have to depend on the "memory" of Snapchat? While "making memories" we actually forget to make memories. We constantly run behind the camera for that one perfect picture to receive numerous 'loves' in Facebook to prove our validation. While chasing after making connection with people on Facebook, we have lost the value of people present in our lives. We go on trips not to find serenity but to get that impeccable shot that would help us sell ourselves in Instagram before people we call "cool". We now accumulate experiences to make our LinkedIn profile look more fancy and to awe others showing our merit. Whatever we do is intended to impress other people. Where have we lost our sanity? What are we doing to our minds? It is time that we stop counting on Snapchat "memories" and start relying on our own before we lose our minds.